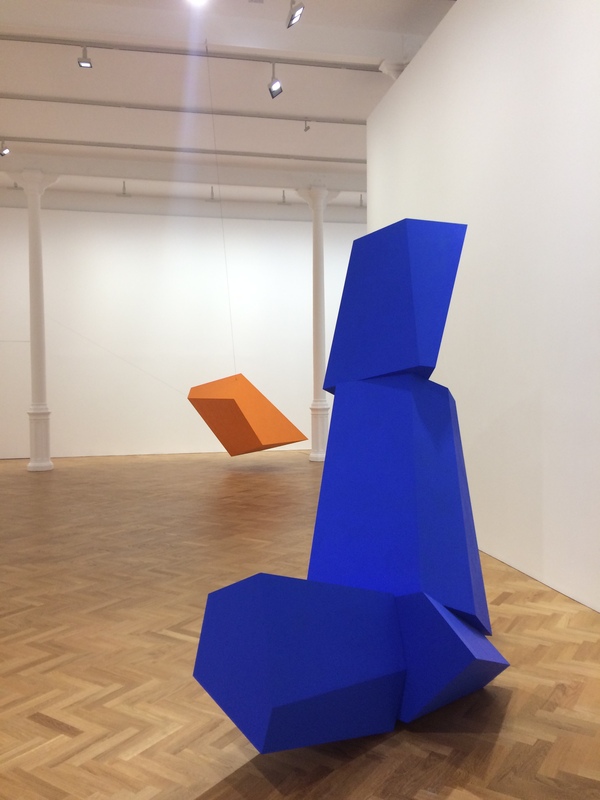 New York artist Joel Shapiro’s sculptures suspended in mid-air at Pace London appear to defy gravity creating an unsettling effect which, as it turns out, is not entirely unmerited. Geometric in strong but subtle colours, they form striking and exhilarating combinations in the gallery. Each time you look at one, it will tend to provide the foreground or background for another. But they are nonetheless separate. There is nothing human about these objects; their corners are sharp; their lines are hard. Their names provide little enlightenment about their meaning. Really Blue (after all), shown below I suspected was a reference to the process. Perhaps earlier it had been slightly blue. I liked it really blue. Yellow May seemed more bile green but I don’t think this had political allusions.They were in place before the election! OK Green was a pleasant but indeterminate colour, but wasn’t it pale blue? No, perhaps not, and again such a debate must have resulted in the name it was given. One of the pieces had a rather plain name – Orange. There was no debate about it. And Orange it certainly was. But perhaps that should change. By and large the wires that suspended the hanging pieces were unobtrusive yet visible. The eye took note that they were there and ignored them. Orange was different it was low hanging and, as it is positioned in a bizarre and intriguing angle, naturally, you are tempted to walk round it. I did so and suddenly tripped but recovered; there was a wire about knee-height tethering it to the floor; the wires that are plain to see in the air, fail to show up against the parquet. About ten minutes later my companion also attempted to walk round Orange, tripped and fell headlong on the floor. Orange wobbled alarmingly as though laughing. Perhaps there was a human element to them after all. It needed, we decided a less plain name, Dangerous Orange? or Trickster Orange. On the way out we noticed a small sign cautioning trip hazard. Tripster Orange would be perfect. When I first entered Rodeo’s second floor gallery to see works by Canadian artist Tamara Henderson, my first impression was that too much had been crammed into too small a room. In most art galleries these days, paintings or sculptures have plenty of room to breathe. Indeed, often they can seem quite lonely surrounded by white wall. Not here. Every bit of wall and window is covered and the room is stuffed with 30 different creations. Apart from the wall coverings, most of them are roughly human size and roughly human shaped. The bodies are a sort of kaftan, rectangular, made out of elaborately decorated and appliqued fabric. There is in each case a discernible head, albeit one made of something like feathers or metal coils. They all have block-like feet. A tremendous amount of work has gone into making them. Some of them are almost transparent; that, plus the sheer numbers, made photographing them difficult. This first reaction that they needed a room at least twice the size, quickly gave way to pleasure as I realised that each of these creatures had a personality and, wandering through them, was like wandering through a crowd. The attendant at the gallery described them as costumes but they weren’t costumes – I decided; they were people. It turned out they had names. : some of the names illuminated. My mother in Ashes sadly seemed clear enough. The figure contained a representation of an urn. in other cases, the names made you wonder about their history. Who was Brenda? What was the story behind Wait in Blue Pearls? I really wanted to know more. I visited an earlier exhibition of Henderson’s work at Rodeo a couple of years back and enjoyed it but this time the work seemed far more complex and exciting. The crowding is part of what makes it. I’ve always thought that restraints were an admirable aide to creativity. This view was reinforced by Antennae at Lubomirov Angus Hughes.The gallery held an open call for works which responded to the current climate of increasing instability and uncertainty. There was the promise that virtually everything submitted would be exhibited in London and from that exhibition, the curators would select works which they believed contextualised the mood of the time. Selected works would then be exhibited at Platform Projects in Athens. There was one big catch – works had to be delivered through their letter box – a mere 24.5 cm x 6 cm. The challenge oddly appealed to me: I have become interested in soft sculptures and I wondered whether it might be possible to post a person through the letter box. The idea was to create a kind of self portrait reflecting how I felt first thing in the morning thinking about the folly of Brexit and the horror of Trump. I even acted it out, lying on the floor but the sculpture had its own ideas and the first head shape I made reminded me of Munch’s scream. I finally decided to go with it and make a female scream. Here she is. Brexit! Trump! Aaagh! or B!T!A! for short. She is nearly 5ft tall, and is actually quite a bit more than 24.5cm wide. However, with her elbows compressed into her chest and wrapped tightly in clingfilm she just squeezed in. Before I arrived in Hackney, I had been pretty certain she would was slender enough. I had rigged up a model letter box out of polystyrene sheeting and had made sure she would go through. When I saw the real thing on the day of the deadline, when it was too late to change anything, I wasn’t at all sure she would make it. Helpfully, she breathed in, no doubt screaming a little more because it must have been uncomfortable. Once she was gone I worried how she would decompress and whether the good people at Lubomirov Angus Hughes would plump her up. I also wondered who else would respond to the challenge and what the standard would be like. At the Private View on Friday, I was relieved to see that B!T!A! had been unscathed by her journey and the general standard of the works was remarkably high. With over 100 works on show there was some incredibly imaginative entries, far too many to show. I particularly liked the clever machine-sewn drawings by Matt Siwerski. I have always felt that the art world tended to neglect the sense of smell, but olfactory artist Lady Michaelle St Vincent had produced the Smell of Brexit – four little boxes representing the stages of grief each containing a different scent. I reflected I hadn’t got to ‘acceptance’ yet. The Map of Nowhere seemed to sum things up pretty well. Poppy Whatmore was even more direct. You Made a Mess of Things, We Made a Mess of Things; They Made a Mess of Things. I also liked Maria Kaleta’s Underworld Faces. The curators will make their choice this week on the works that will go to Athens. I hope T!B!A! makes it. She would like the trip. I hope the works I have shown here make it too. But whatever the outcome, it was tremendous fun taking part. “PLASTERRORISING – Create and maintain a state of extreme fear and distress in a soft mixture of sand and cement and sometimes with water; fill with terror to form a smooth hard surface when dried. EGGLYING – An oval or round object laid by a female bird, reptile, fish or invertebrate saying something untrue about containing a developing embryo. BRICKOLLAGING – Create a piece of art by sticking various different materials such as photographs and pieces of paper or fabric on to a small rectangular block typically made of fired or sun dried clay, used in building. This is quite a departure from Dimitriadis’ ceramic practice, which saw him a finalist in the 2016 Broomhill National Sculpture Competition. While ceramics remain, they don’t take centre stage in the installation which comprises a precariously balanced collection of objects – paper-covered bricks, brick-shaped shaped cages, some containing small and intriguing objects, all of which have significance: Lego, rice, eggs, even herbs which I know grow high in the mountains above his home village in Greece. I spot a small ceramic column, reminiscent of Escape from Reason, one of the works he is showing at the Murmurations Gallery in Bexhill, where he is exhibiting along with Paul Tuppeny and me. “Look carefully,” he said, “you will find your own name.” Sure enough there was a small part of a poster for The Texture of Time. The focus of the installation is in the central structure but it also spreads out around the room. There are brick shaped gaps among the ultramarine portraits; the missing pieces appear on the surrounding walls As you circle the anarchic structure, it draws you in. The longer you look, the more you see. These oddly juxtaposed objects are more than just a reflection of Dimitriadis’ life, some you can interpret; the rice – marriage, the Thomas the Tank Engine – children; the snail shells, the frustrations of gardening, or indeed frustrations generally. Thus they are common to us all, reflecting the many facets and compartments that we all have in our lives. Overall, an excellent example of Brickollaging.